On September 27, 2012, we placed your application in the oath scheduling que. We will send a notice when the ceremony is scheduled. If you move prior to the scheduled ceremony, please use our Change of Address online tool to update your case with your new address or call our customer service center at 1-800-375-5283. 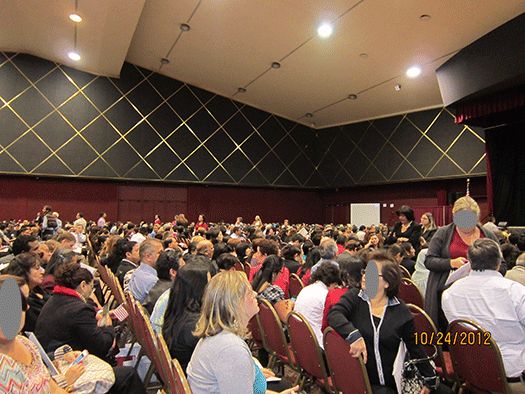 Naturalization Applicants: you will receive your certificate at your oath ceremony. You can expect to be scheduled for an oath ceremony within 45 days of receiving your recommended approval. Many offices schedule approved applicants for the oath ceremony on the same day as the day of the interview. Please check the local office profile page on our website to determine if the office where you will be interviewed schedules same day oath ceremonies. USCIS local office in San Diego usually (always?) schedules their monthly oath ceremony on a Wednesday, so I’m guessing it will be October 24th or 31st. However, with California’s voter registration deadline coming soon, I’m hoping that USCIS will take that into consideration and actually holds a ceremony earlier next month. We’ll see. On October 3rd, I received the oath ceremony notification in the mail. Unfortunately, it is scheduled for October 24th, two days after the California voter registration deadline (15 days before general election). I don’t understand why USCIS couldn’t organize a ceremony one week earlier, so that hundreds of new citizens would be able to vote in this year’s election. Oh well…I’m still happy my journey will finally be over, but wish it were a couple days earlier. While waiting for the oath ceremony, I sent an email to USCIS Public Engagement and expressed my disappointment over the timing. An officer replied on the 9th, and told me that new citizens are actually exempt from the 15-day registration deadline. She also said there would be representatives from the County Registrar of Voters at the oath ceremony to explain in more details. I was very glad when I saw the email because I sincerely wanted to vote. The day is finally here! On October 24, I drove to the San Diego Civics Theater for my Oath Ceremony. My appointment was 8am, but I knew the actual ceremony wouldn’t start until 10. So I arrived just past 9am to avoid the long lines. The downside, however, is that I would also be one of the last to receive my certificate at the conclusion of the ceremony. 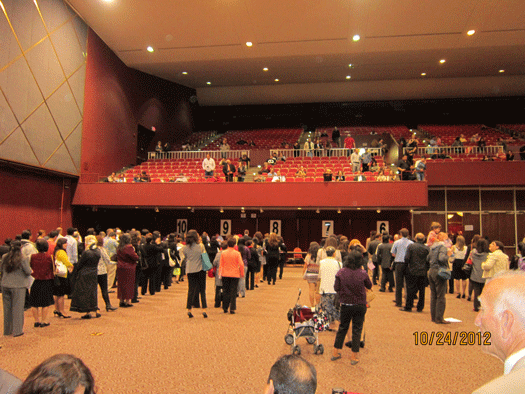 Inside the hall there was a row of tables stationed by USCIS staff. I handed over my green card and appointment notice. The officer simply put my green card in a waste bin, which already had a bunch of cards – some were already cut up. I almost asked if I could keep it as a souvernier 🙂 The officer found my name in his log book, and assigned me to station 9 for receiving my certificate. I was then given a packet as well as my appointment notice with a big number 9 written on it. I found a seat and started looking through the package: a certificate holder, some materials about voter registration, flyers regarding how to apply for a passport, and a letter from President Obama welcoming new citizens. I heard that sometimes there may be light performance on stage while people wait for the judge, but not today. I played Angry Birds for a while. The Oath Ceremony started shortly after 10am. A person from the Department of State came on stage first to discuss U.S. passports and ways to apply for one. Then a lady from the San Diego County Registrar of Voters explained how to register and vote, and the importance of voting. Then the District Judge and a couple of USCIS officials arrived. After the National Anthem, the Judge delivered a short speech welcoming all of us. She mentioned that there was over a thousand people in the room to become new citizens on that day. She asked people to stand up to be recognized, and to receive a round of applause from the audience when their home country was called. It was actually amazing to see how many countries were represented in this one event. And people from countries such as Afghanistan and Iraq received loud cheers from the crowd. Although most countries had only a couple people representing them, when Mexico was called nearly half the room stood up! This concluded our oath ceremony. What happened next was a little embarrassing. 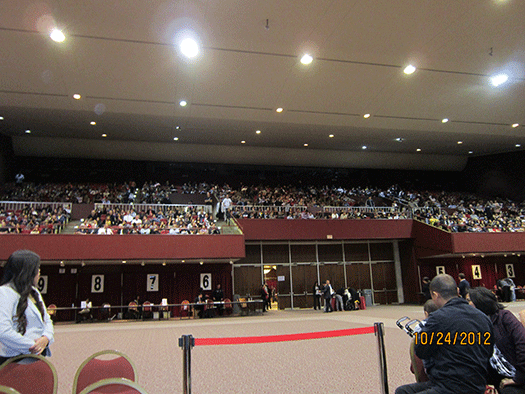 We were supposed to remain seated until being called to the USCIS stations. One section apparently didn’t hear it, and started walking over to the tables freely. Then people sitting in other sections started to follow them, and an orderly gathering quickly turned into a free market. An organizer had to use a loud speaker and requested everyone to go back to their seats. This time it went smoothly and I got my certificate in about 25 minutes. DOS and county officials were available afterwards to answer questions on passports and voting. I completed my voter registration on site. Since it was already too late to vote by mail or go to a poll station election day, I could bring my receipt and vote at the registrar’s office. I plan to do so within the next few days. By now my journey to U.S. citizenship is officially over. I submitted my application on May 9, 2012, and received my Naturalization Certificate on October 24. Compared to my green card application, which took five years and many unexpected turns, this has been smooth sailing all the way. More importantly, it was done just in time so that I can finally cast my vote on the presidential election and California propositions. You can register up to 7 days before the election if you recently became a citizen you will need to go your registrar of voters office in your area..
Congratulations on getting your citizenship. I’m still waiting for my oath ceremony so your description was very helpful. I wish I had found your blod earlier in the process, rather than on step 5! Nice!!! !………..very helpful in my case. Excellent blog! I started my journey on May 1st and was so glad to find you, each time I get a letter or text message I go back to your blog to compare the time line. I just got my interview letter today – scheduled for Sept. 12th. Hopefully, I will be all squared away come October. This blog is detailed and funny, thank you, thank you! Great blog! Thank you for all the info and congratulations! It’s a good write-up of your experience. Thanks for that. I’ve just completed step 3 (finger printing) and was wanting to know what to expect. Your write-up was very helpful in understanding that process. Coincidentally, the dates of step 1, 2 and 3 matched almost exactly; month and date wise. Of course, the year you applied was a couple of years ago , mine is this. Thanks to the USCIS guys; they do this job routinely with smooth precision day in and day out. It’s really great blog! You explained all the stages of the citizenship process as a movie story. Yesterday I got the finger print appointment notice scheduled on 10/23/2015. Thank you for all the information and congratulations! I will apply for a citizenship and I have a quick qustion in part 7 (information about your employment and schools you attend) which asking about list last five years of employment, student and unemployment attended. In my case, I was not working first 3 yeasrs, only studing my master degree. I have filed tax last 3 years form 1040 and I was putting my income at section number 12 (business income or lose) because I was not work and my family was sending to me money and I was receiving form 1098 from the university every year because i took a loan. but right now I am working and i filed tax forth year as an employer. So my question is how can i explain this in n-400 form part 7?. do I have to mention about that I got money from my family or only tell about my current job and student attended only? Will they ask where is my income for these three years? How many people can come with you to the ceremony? I don’t think they limit the number of guests. During my ceremony guests stayed in a separate area, so maybe at some locations capacity is limited but I don’t think they impose an overall limit. does it any way help to apply 90 days before reaching the 5th year anniversary? I’m also bit confused that on how to apply for the early n 400? Hello, chances upon your blog. Question – did you have a name change? I added a middle name and I hear that leads to delays between approval and oath taking, so wanted to know.